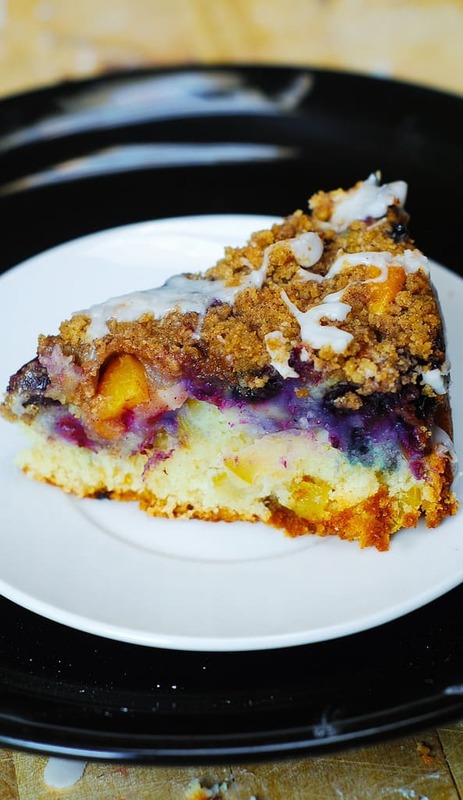 Apple, Blueberry, Peach Coffee Cake – a perfect Summer cake. 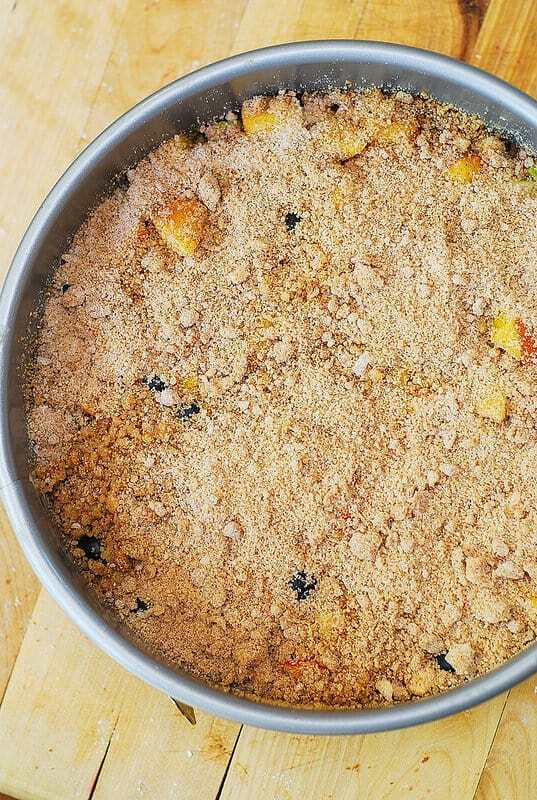 Luscious crumb topping is made with brown sugar and cinnamon and sprinkled on top of fruit and berries. Top all of this with the vanilla glaze and you have a winner! 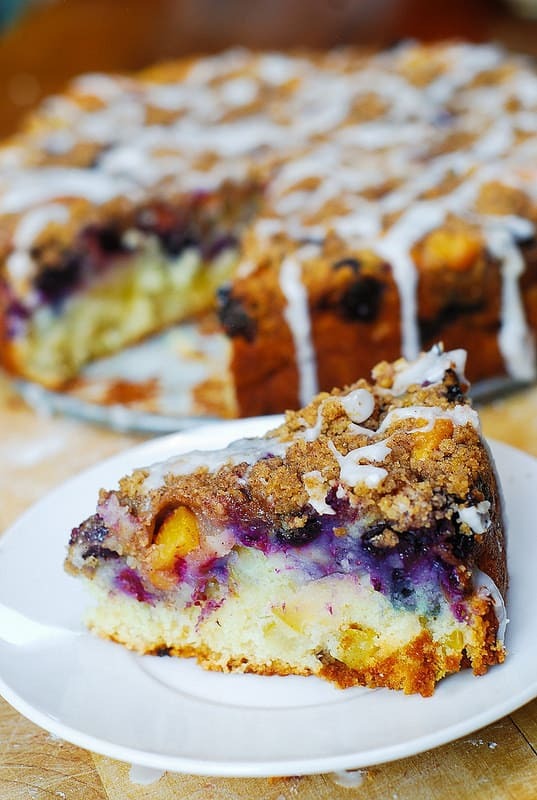 If you want to turn a simple coffee cake into something more colorful and Summer-ish, this recipe is perfect for you! 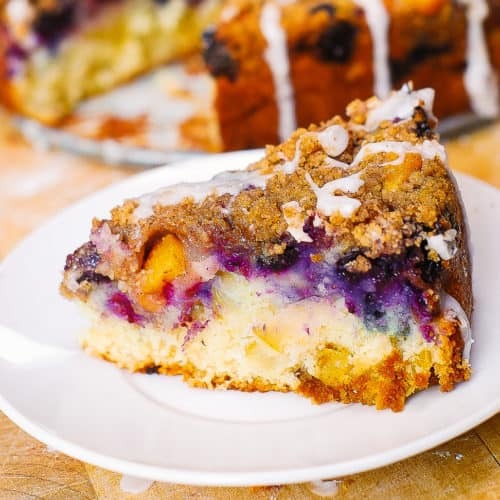 This is the best coffee cake for the Summer: with generous amounts of blueberries, apples, and peaches – all together in one cake! The top of the cake is richly covered with crunchy cinnamon crumb topping. Then, it’s drizzled with the vanilla glaze! This is one of the best coffee cakes you’ll ever taste! It’s especially wonderful if devoured the same day it’s baked! 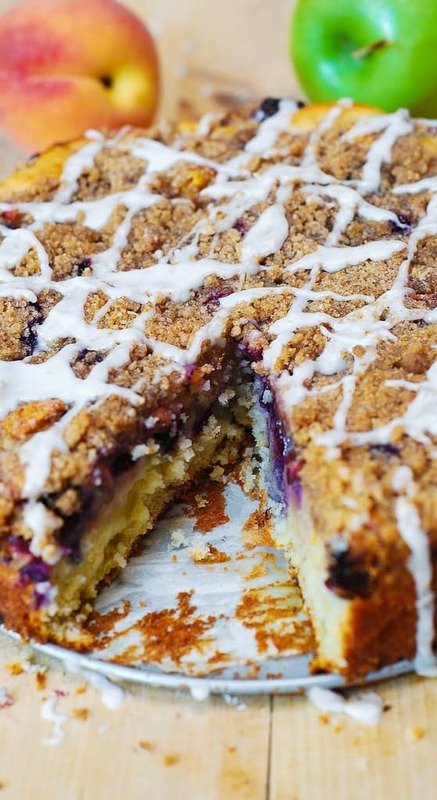 It’s baked in a springform pan, which makes it easy to release the coffee cake and still keep its pretty shape! I like to line the bottom of the springform pan with parchment paper, which ensure even cleaner release from the bottom portion of the pan – see detailed instructions below. Because this coffee cake has a crunchy crumb topping, it is at its very best if consumed within several hours after it’s baked and cooled. The streusel keeps its wonderful texture for the first 24 hours – so, if you plan to eat this cake within 24 hours, cool the cake completely, then just loosely cover the cake with parchment paper, leaving spaces for air – this will allow the top of the cake to stay nice and crunchy! If you plan to store the cake longer than 24 hours, store it in an air-tight container (or wrapped in plastic) at room temperature for 2days, or in the refrigerator for 5 days. Make sure to cool the cake completely before storing it. Keep in mind that the crumb topping loses some of its crunchiness when the cake is stored longer than 24 hours, but it still tastes wonderfully delicious! The cake should be completely covered with crumb topping. The cake is now ready to be placed in the oven! 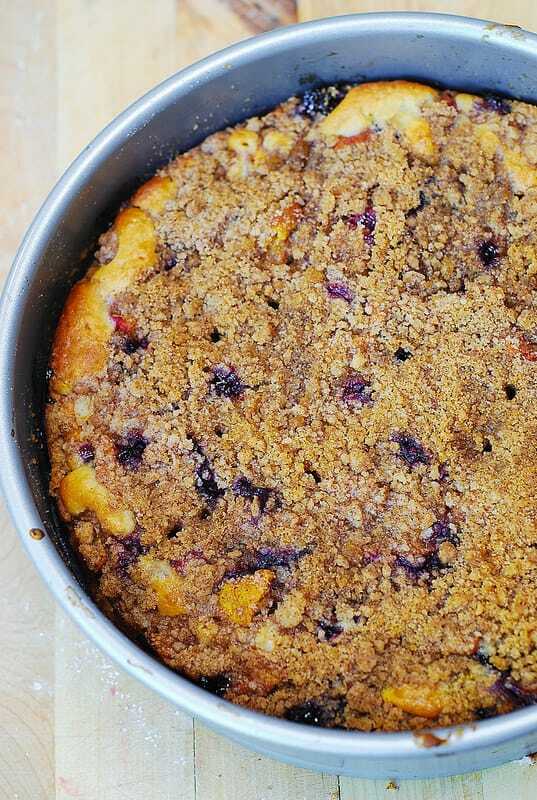 Apple, Blueberry, Peach Coffee Cake - a perfect Summer cake. 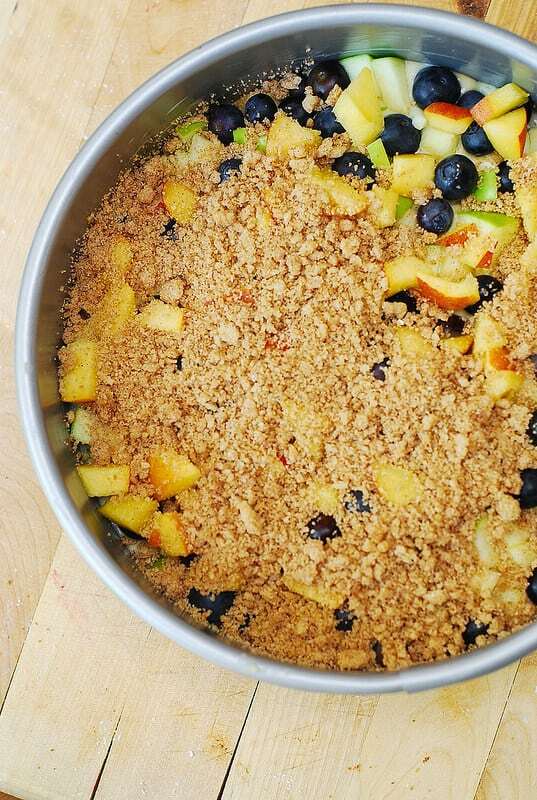 Luscious crumb topping is made with brown sugar and cinnamon and sprinkled on top of fruit and berries. Topped with the vanilla glaze. Pre-heat oven to 350°F. Line the bottom of 9x3-inch springform pan with parchment paper. Grease the side of the springform with butter or cooking spray. In small bowl, mix in crumb topping ingredients (brown sugar, flour, cinnamon, cold butter). Cut in butter with fork or your finger tips until crumbly. Set aside. In a medium bowl, mix sifted flour, baking powder and salt. In a large bowl, combine 3/4 cup white sugar, melted butter, and egg, and, using electric mixer, beat on medium-high speed until light and fluffy - 1 or 2 minutes. Reduce speed to medium, then mix in milk, vanilla just until combined. Keeping the mixer speed low, mix in flour mixture, gradually, just until combined. Do not over mix. Fold in half the apples and half the peaches into the batter. Do not fold in blueberries in the cake batter. Pour the cake batter into the parchment paper lined springform pan. 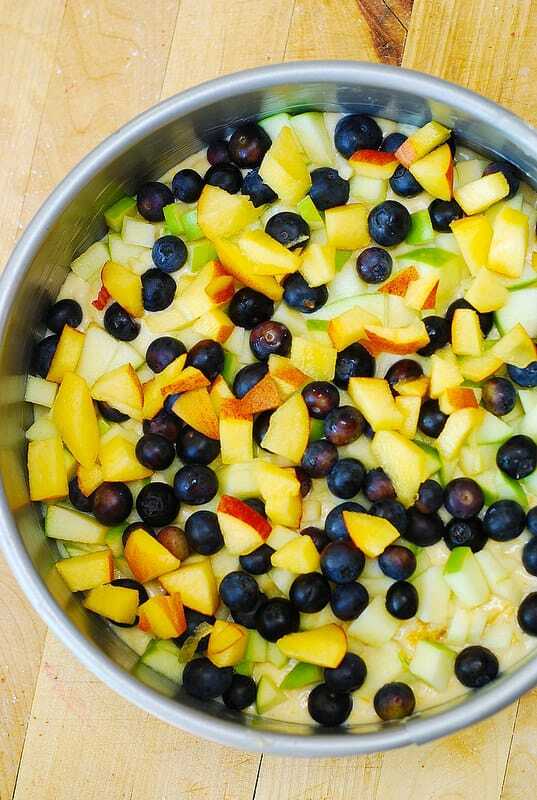 Spread blueberries, remaining apples and peaches over the top of the cake. Top with the crumb topping - it should cover all the fruit. 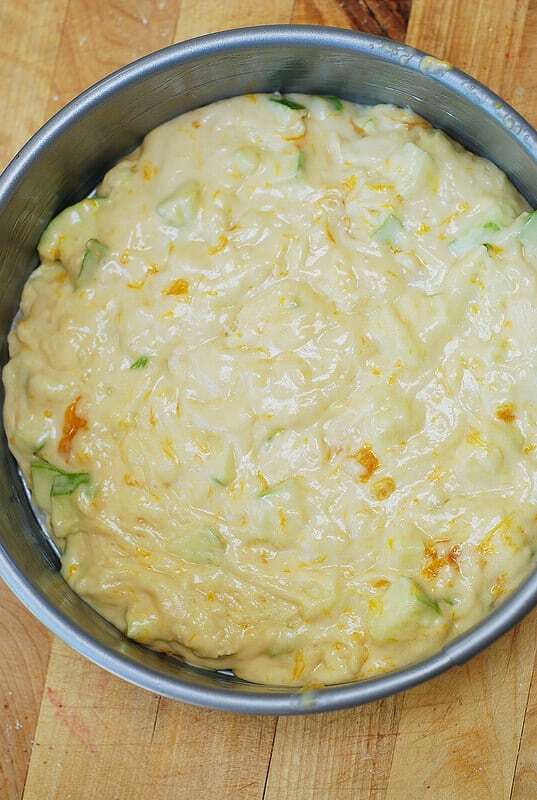 Bake about 45 minutes or until the tester inserted in the center of the cake comes out clean. Let cool in springform pan on a wire rack. After cake has cooled for about 40 minutes, release the cake from the springform pan. At this point, if the cake is cool enough, you can slide your hand under the cake, between the parchment paper and the bottom of the pan ,and move the cake with the parchment paper attached to its bottom onto a cake plate easily. Combine all glaze ingredients in a mixing bowl, and, using spoon or electric mixer, mix until smooth and of the desired thickness. Drizzle over the cake. I’m not sure what others had an issue with. I made this last night and it came out perfectly. I did use blanched/frozen peaches and they were super juicy so it made me worry a little bit. My knife came back wet at 45 minutes, but not doughy. I baked it for another 15 minutes and it still came back wet. At that point, I turned my oven off and left it for another 15-20 minutes. The knife was a little wet at that point, but it was clearly fruit juice and I knew it’d set as it cooled. I don’t know if it even needed that extra time, but those juicy peaches had me cautious … Never the less, it’s delicious and beautiful. Modifications: I used almond milk in place of dairy milk, I added 1/2 teaspoon vanilla (I always add a little extra vanilla to my recipes), and I skipped the glaze just to reduce the sugar content a little bit. 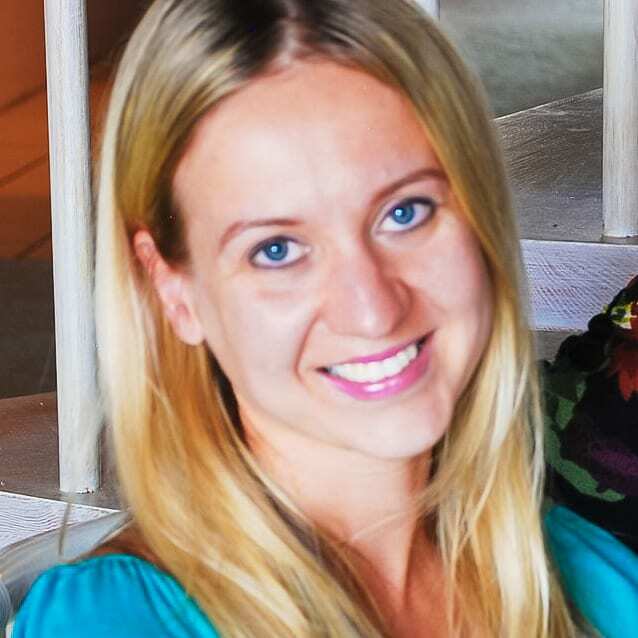 Thank you for your feedback! So glad you liked this cake! 🙂 And thank you for sharing your modifications.